Statistics published in February by the Department for Communities and Local Government show that 2,744 people slept rough in England on any one night in 2014 – a 55% rise on 2010 figures. Statistics published in February by the Department for Communities and Local Government show that 2,744 people slept rough in England on any one night in 2014 – a 55% rise on 2010 figures. Those who are homeless, and particularly rough sleepers, experience worse foot health than the wider population. They also struggle to access foot care services. In September, the Queen’s Nursing Institute (QNI) launched new guidance for community nurses on how to support homeless people to improve their foot health. The 12-page booklet, part of the QNI’s homeless health project, gives practical advice about looking after feet in difficult circumstances, alongside an overview of the foot health conditions that are prevalent among the homeless. People sleeping rough often have limited choice of socks and shoes, and are outdoors in all weathers. This situation can lead to blisters, fungal and bacterial infections and, in rarer cases, frostbite or trench foot. Other common foot conditions include chilblains (caused by exposure to the cold), bunions, ulcers, Athlete’s foot, pitted keratolysis (caused by excessive sweating), and in-growing, overgrown or fungal toenails. Intravenous drug users may use their feet as an injection site. People with diabetes are at particular risk of foot conditions. 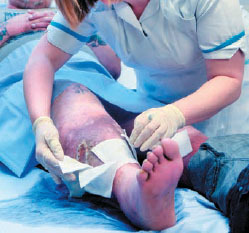 Antibiotic treatment should be provided immediately to people with a diabetic ulcer injury, because several days may have passed before the person sought help. If not caught quickly, infection can infiltrate the bone. Assess for neuropathy or peripheral vascular disease. Treat minor injuries with topical antiseptic cream. In the case of frostbite, check for symptoms of hypothermia and seek emergency help if it is suspected. Community nurses are well placed to offer advice, support and simple care, says the QNI. This may include advice about hygiene, for example, using baby wipes if washing facilities are unavailable, and visually checking feet on a daily basis for signs of wounds. Community nurses can also refer patients to podiatry services for further assessment and treatment of complex conditions. Remember that providing foot care can be an opportunity to identify other conditions, such as diabetes. Use the appointment to talk to the person about their housing status and living conditions, linking them with local organisations that can help, advises the QNI. ‘Some nursing staff have little awareness of homelessness and sometimes lack empathy. I think the guidance will be especially useful for drug and alcohol teams, emergency department nurses and nurses working in the community, including those in podiatry.